My family's recent experience with Country Cottages assisted living in Hoover, AL has been a nightmare. This was my first experience with caring for a loved one and I thought that we had found the perfect place for my father. I was wrong. We've had many problems. To begin with, our contract signing very was rushed, and was completed by an employee who I never saw again after that day. There were many things that were explained incorrectly or not at all. When we were recruited, there were lots of promises made. Haircuts, doctor's visits, and trips to the store for supplies are just a few of the services that we were told that my father would receive that never or very rarely happened. I would usually receive a very demanding phone call any time Dad needed anything. I was happy to do those things, but am still very confused about what we were told. Also not explained to me was the fact that Country Cottages reserves the right to raise their rates, as much as they would like, at any time, without notice. A few months ago my father's rates were raised by over $300.00 a month, less than 2 weeks before the payment was due. Certain members of the care staff and management began to lie to us and greatly exaggerate details about his health in order to raise their rates (ridiculous, over the top exaggerations). Eventually the director used this false information to force him to move out against his wishes. This situation has caused my family much hardship. I strongly recommend that you save your time, money, and sanity and avoid this place at all costs. The best way to get to know a community is by scheduling a tour. See the facilities, meet the staff and residents, and get a feel first hand what it's like to live at Country Cottages at Birmingham, Hoover Assisted Living. Nestled in a quiet cul-de-sac in the suburbs of Birmingham, Country Cottages – Hoover is a collection of three intimate retirement homes providing high-quality assisted living and memory care services to Alabama seniors. We provide supportive services to mature adults with a range of care needs. We can accommodate seniors who need a little extra help with life's daily chores as well as those facing the challenges of late-stage Alzheimer's. Country Cottages – Hoover is managed by Cottage Senior Living, a family owned and operated provider of senior living. Cottage Senior Living is dedicated to helping residents maintain their dignity, independence and choice. Our daily activity programs keep residents active and engaged with community life. Seniors can keep fit with our Let's Get Moving exercise classes, enjoy a game of Pictionary or Bingo with friends, take trips to local shops or stimulate their minds with after supper conversation or current events discussions. Residents enjoy their own private rooms with ample closet space and a private bathroom with shower. Cozy common spaces are located throughout our cottages and each resident has access to a delightful country kitchen for their own use. For added comfort, Country Cottages – Hoover provides residents with weekly housekeeping and a daily tidy-up service for all residences. Three home-style dishes are served per day and guests are always welcome to join us for a meal. Scheduled transportation into town and to medical appointments is also offered for added safety and convenience. Our core CareSteps program provides 24-hour care and attention from a nurse-supervised staff. Residents receive hands-on professional assistance with activities of daily living, such as walking, bathing, managing medications and grocery shopping. Residents challenged by Alzheimer's and dementia receive even more comprehensive care and attention at Holly Cottage, which is specially designed for seniors with memory loss. 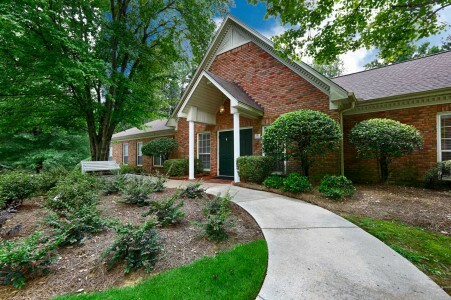 Experience family-style senior living at Country Cottages – Hoover.